For further reading after assignment 1, my tutor suggested that – among other things – I should read Tod Papageorge’s essay on the way Robert Frank had been influenced by his friendship Walker Evans and by Evans’ book American Photographs. The content of Papageorge’s essay did not directly appear to feed into the work I did in part two, but then, as part of the work leading up to Assignment 3, I kept a diary, which included sequences of everyday photographs taken as I wandered through my life, seeing things. While the most obvious influence on this work was Stephen Shore’s American Surfaces (I was working with a compact, portable camera, often using flash and generally the pictures were taken while I was on the move) the range of photographic reference points was not limited to Shore’s work. The photographs illustrating this post, I hope, demonstrate this. This entry was posted in Context & Narrative, Coursework, Exhibitions & Books, Part 3 on March 12, 2017 by Simon Chirgwin. Write an essay of 1,000 words on an image of your choice. The image can be anything you like, from a famous art photograph to a family snapshot, but please make sure that your chosen image has scope for you to make a rigorous and critical analysis. If you choose a well-known photograph, take time to research its context – the intentions of the photographer, why it was taken, whether it’s part of a series, etc. Add all this information into your essay to enable you to draw a conclusion from your own interpretation of the facts. 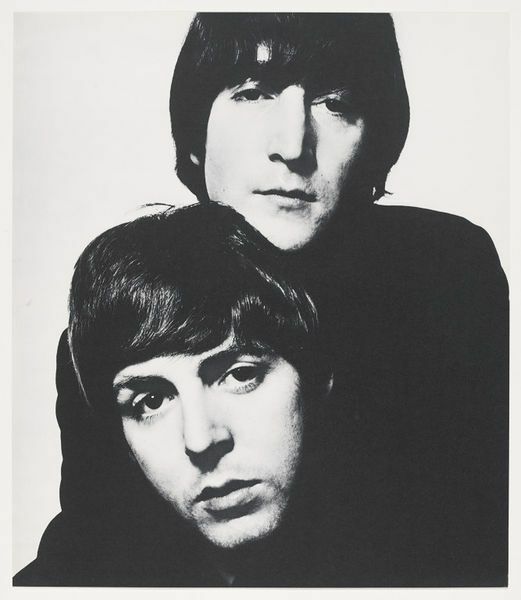 a: Lennon and McCartney (seen as part of the exhibition Bailey’s Stardust, Scottish National Portrait Gallery , 2015). The picture comes from the set published as Bailey’s Box of Pin-Ups in 1965. I’ve liked his work for about as long as I’ve known that photographs are taken by people with names and popped over to see the exhibition with my son one Sunday morning in the august gap between finishing The Art of Photography and starting Context and Narrative. As a result, there isn’t a post about the exhibition on my blog here (it did exist as jotting in the notebook I lost at Stansted on the way up to see James in Glasgow another time in March, but this has always seemed an exhibition better written about in relation to Identity and Place) but I thought straight away that this one would be a good candidate for C&N A4. This idea was strengthened by the plentiful, not always damning but never quite unequivocally praising, criticism of Richard Avedon’s West pictures in Criticizing Photographs. There are a lot of similarities between Avedon and Bailey – black and white, plain backgrounds, never quite regarded as art, fashion photographers etc – so there is plenty to write about in that before you get onto the difference between a single portrait (about the sitter, and there are plenty in the contact sheets for the session of both of them) and a double portrait (about the relationship between the two people) or start thinking about the whole Picture Of v Picture By thing. 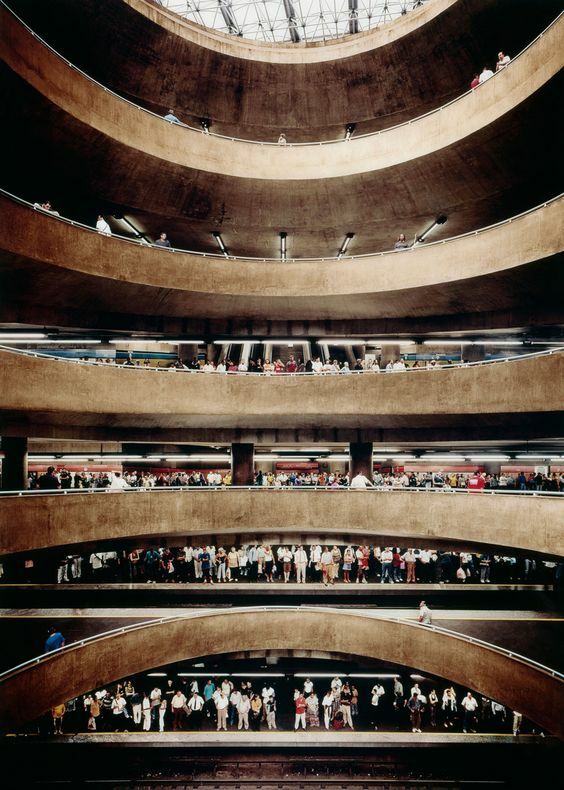 Andreas Gursky was taught by Gerd and Hilla Becher at Dusseldorf, is classed as part of the Dusseldorf school of photography (along with Thomas Struth and others). Until recently, a print of his picture Rhein II (1999) was the most expensive photograph ever sold at auction. Like Rhein II and the other picture by Gursky exhibited at The Barbican (Paris, Montparnasse,1993) it was printed in a limited edition of six and is absolutely enormous (nearly three metres by two metres). Presumably it’s worth a lot of money too, It’s size means it is possible to stand and stare at the picture for a very long time, soaking up the detail with the picture filling pretty much your entire field of vision. 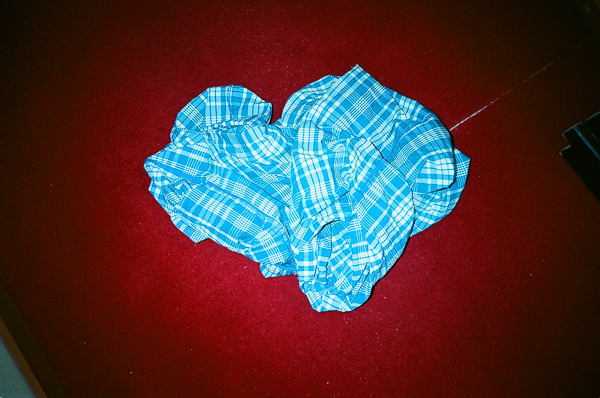 This was the inspiration for my constructed image from part one of the course. The many floors of New Broadcasting House lent themselves to this sort of treatment and It also helped that I havebeen to Sé Metro station in Sao Paulo and have some pictures taken there hidden deep within my crate of prints that I need to do something with. For the purposes of Assignment 4. this would be great picture to look at from the point of view of both the physical scale and financial value put on this sort of work, the way the constructed reality gradually becomes obviously false as you look at the picture and the way it fits in with Bate’s writing on how fine art painting’s genres appear to have reasserted their hierarchy of merit with the rise of Neo-Pictorialism. 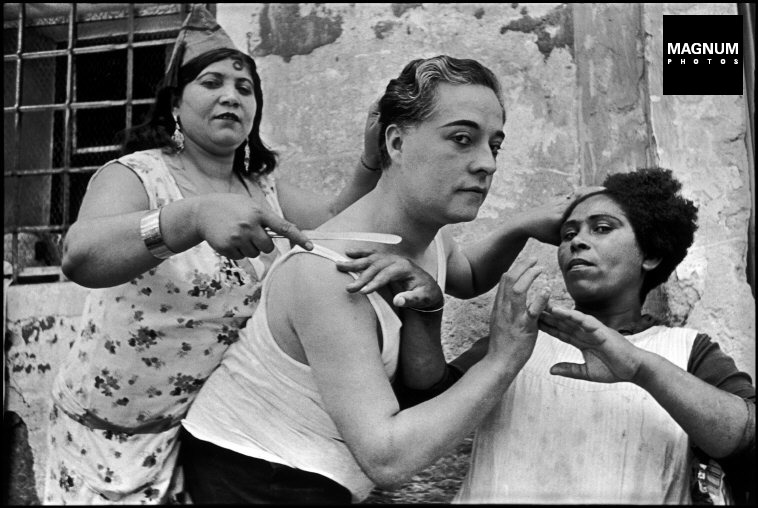 And then finally, various coincidences have led me to think about this early picture by Henri Cartier-Bresson. At the time I wrote about the exhibition it was part of,I was going to use this picture along with one by Shirley Baker (whose exhibition at the Photographers’ Gallery I saw at much the same time) as dry runs for trying out the stuff in Terry Barrett’s book, before tackling assignment four. Like so many other good intentioney things, I didn’t get round to writing it up of course, but the picture kept burbling around somewhere inside my head while I got on with putting off other things, and sometimes even getting around to do them. And then it got pulled back to my head by a number of coincidences. Firstly, while pulling together assignment 3, I had re-read online, Tod Papageorge’s Essay on Influence and enjoyed it to the extent that I bought the book it is collected in (Core Curriculum). One of the other essays in the book is on Cartier-Bresson (p. 30-39) which contains a lengthy digression on “a picture taken in the thirties in Alicante” that looked as if it was taken with a shorter lens than is normally associated with Cartier-Bresson” (a 35mm lens rather than a “normal” 50). The digression was ultimately inconclusive, but i had always wondered about whether this picture (and some other early Cartier-Bressons) had used a wide lens (there’s a slightly distorted “bulginess” to some of them – in this one the central figure looms out at you more than you would expect with a 50mm lens – and a depth of field that would be hard to get with a 50 without slowing the shutter-speed right down) and the Spanish reference seemed to indicate this one. And then here was Cartier-Bresson’s interest in surrealism and friendship with the surrealists to set alongside my semi-surreal opening up of assignment three for comparison’s sake, and I was reading Papageorge on a plane flying back from Moscow, where I had been shooting one of the later photo-diary sequences on a trip for work. There seemed to be a possible link between Cartier-Bresson’s very early work in the 30’s and my lunchtime neo-flaneuring while overseas on business. The surrealists were of course interested in the injection of chance into their work and this seemed rather like a gifted intellectual objet trouvet. Accepting that I would never get round to writing the descriptive warm up post, I added the picture to my shortlist and started thinking about what I could write about it for the assignment proper rather than my warm up. In the end, it was quite simple really. While both the Gursky and the Bailey and the questions they raise about art and the position of photography in the gallery (on the wall, obvs.) engage me intellectually, both are quite flat in terms of their effect and neither really bit into the realm of my feelings. Something about the Cartier-Bresson had kept drawing me back to it while i was at the exhibition and then had continued to nag at me afterwards. This was at the very least an indication that there might be a punctum there for me to explore alongside the more manifest content of the photograph. I also like the fact that – like much of his early photographs – it is not contained by the idea of “The Decisive Moment”. My first degree (Joint Honours English Literature and Film & Television Studies at Glasgow, back in the 80s) contained a lot of theory, so I haven’t had to go through the pain threshold experienced by (some) people the first time they come acoss post-Saussurean linguistics, Levi-Strauss, Lacan et al and was quite pleased to see that I haven’t forgotten it all or lost my ability to concentrate while reading long, dense passages of translated prose. It has been useful to bring this dogeared grounding in theory up to date and to point it more in the direction of stills photography by reading Catherine Belsey’s brilliant, readable (and properly funny in places) Post Structuralism – A Very Short Introduction and Richard Salkeld’s Reading Photographs. While I own a copy of Mythologies (it’s somewhere in the attic, boxed up an waiting for us to move, early next year sometime), I hadn’t read much Barthes before the last year. I have now read Camera Lucida at least twice and quite like it, as much for Barthes’ search for his lost mother’s image, as for the framework it gave for thinking about photography. That said, I like the distinction between punctum and studium and the onus it places on the viewer to make their own meaning of a picture and admire the cheek of only referring twice to pictures that aren’t of people while also effectively dismissing “shock” (Chapter 14, p. 32-34) and with it almost everything Cartier-Bresson took as a cheap trick, rather than something of value. But more useful, perhaps was the considerable amount of discussion in the second half of the book of the meaning of the direct address to the camera (and through it, across time, the viewer) and the way all photographs are – to Barthes in his bereaved state at any rate – mementos mori. David Bate’s Photography: The Key Concepts (‘The Pictorial Paradigm’, p. 137-140) was excellent in terms of providing a genre-based framework for looking at photographs and to link it back to the hierarchy of subjects used by the 18th/19th century French Academy and then re-applied (by critic Michael Fried and others) to incorporate photography into art photography as the 20th century came to a close. Cartier-Bresson (and the Street Photography he was a forerunner of) fits neatly into the lowest class, of genre painting (the everyday lives of non-noble mortals) itself quite easily. Bate’s more recent book (Art Photography) further expands on a lot of the ideas in this section of The Key Concepts. Finally, in terms of writing the essay, the structure outlined by Terry Barrett in Criticizing Photographs (description – interpretation – categorisation – context) forms an easily applied structure for the assignment proper. I find Barrett’s categories of photographs (Descriptive, Explanatory, Interpretive, Ethically Evaluative, Aesthetically Evaluative and Theoretical) interesting but – as is almost any all-encompassing theory of anything – have my doubts as to how useful they may be. What do I See? – Description – 3 women. Mysterious thing taking place. Matisse dancers; witches in MacBeth; Razor. Layer upon layer of ambiguity. 2: So how does it work? 3: What is it not? The surreal (With Spanish location) Un Chien Andalou + Bunuel; dreams; disturbing? 5: Where Am I really? – In a gallery, looking at a photograph. What are prints for – display (Elton John; Tate Modern)? Would you have it on the wall of your house? Which wall? This entry was posted in Assignment 4, ASSIGNMENTS, Context & Narrative, Research and Reflection on December 14, 2016 by Simon Chirgwin.